An untitled recipe for some sort of ball of meat or roll. I am calling it meatballs for lack of a better name. Morton’s Tender Quick is a curing agent, not a meat tenderizer, generally used to cure meats such as salami and corned beef. I’m not really sure what these may really be! 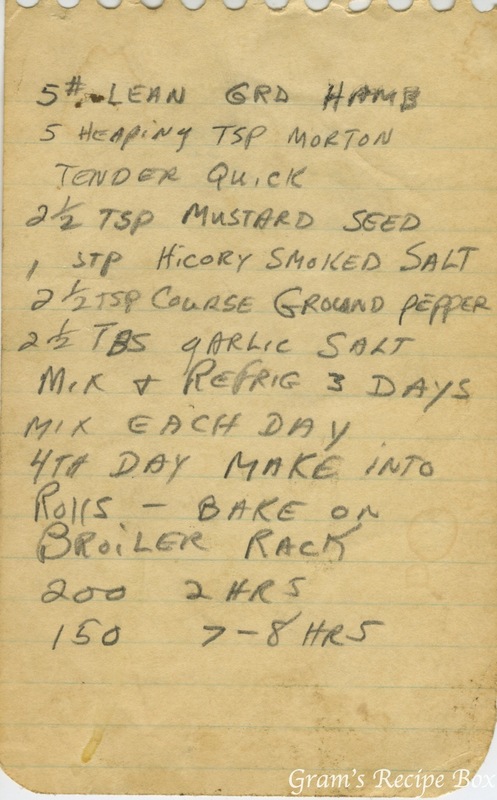 UPDATE: Thanks to site readers for pointing out this is probably a summer sausage or homemade salami recipe. I’m sure this is not meatballs! Sounds like some type of summer sausage or similar kind of sausage – especially since it is formed into rolls. Yes, this makes much more sense than meatballs! We never made summer sausage so it didn’t even occur to me. thank you!! This is a recipe for homemade salami or lunch meat. Very much in the 70ths. Of course! Now it makes perfect sense. Thank you!! I was thinking meat log–guess summer sausage/lunch meat sounds more appetizing than meat log. It also explains the low heat for the long time. We never made anything like this either so it was completely outside my frame of reference. As Mrs.Marvel said–now it makes perfect sense! Comments like this just make my day! So glad you found the recipe :-).